The enchanting cityscape of Strasbourg claims abundant reasons for a visit. Located in northeast France, it was the first city centre to be classified entirely as a World Heritage Site by UNESCO, specifically known for its charming historical center - the Grande Île. Home to many European Institutions, the capital of the Alsace region also offers a discrete cultural palette and a grand architectural presence with a blend of Gothic components and fairytale-like buildings. On sunny days the city appears to be a riverside painting brought to life as the locals cycle their way through the green parks and beside the rivers that cut through the city center. 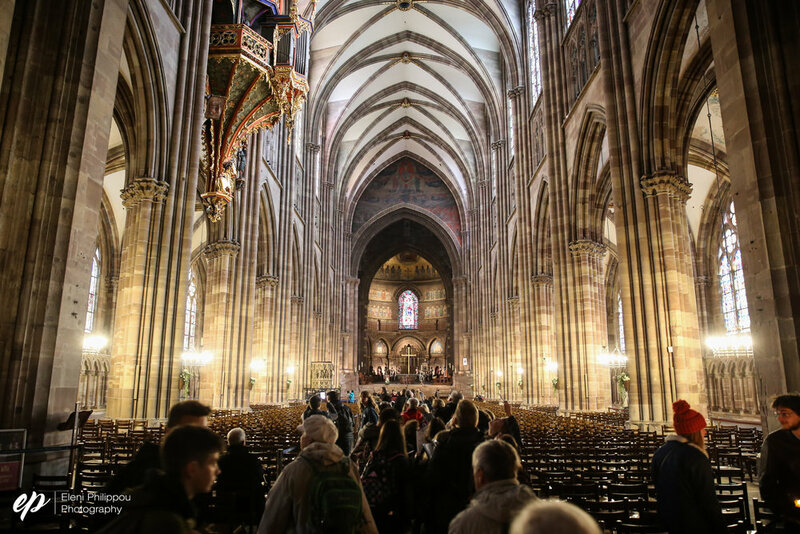 In a brief yet thorough exploration of Strasbourg, I have assembled a couple of recommendations to consider during your next trip to this French city. Cathedral - Let's get the tourist spots worth visiting out of the way first. You couldn't avoid the Cathedral even if you wanted to. Either everyone will direct you to it or its tall omnipresence will haunt you through the city until you go, and it is definitely worth it - and free. After you spend a good amount of time in awe of its intense sculpted details and exalted interior, stop and listen to the street musicians usually sat outside the entrance complementing the Cathedral's presence. Botanical Gardens - If you're a nature lover or an environmental researcher be sure to visit the Botanical Gardens within the main university campus that hosts an arboretum, ecological beds and most notably a two-story tropical greenhouse. Parc de l'Orangerie - Do prefer a ride in Parc de l'Orangerie though, one of the most beautiful and known parks of the city. Take a stroll to its mini farm and zoo to see flamingos and storks (now threatened by extinction) and don't forget to go for a boat ride at its graceful lake featuring a waterfall. Pavillion Joséphine is also worth a visit - built for Napoleon's I first wife - that today hosts various events and exhibitions. Petite France - An area packed with picturesque views and colourful buildings. The hub of the city and the ideal place to get lost in and explore its restaurants and galleries. Look for small pastry, chocolate and cheese shops that will surely blow your noses away - if you're not a cheese fan, prepare yourselves. Filled with pebbly streets, Petite France is definitely recommended to be explored on foot or bike. Péniches - These boat café-bars are found in Petite France and offer a different night out as you can enjoy your drinks on a boat whilst admiring the nocturnal lights reflected in the river. Try out Café Atlantico on Quai des Pêcheurs. Eat, drink, be merry - One simply cannot leave Strasbourg without trying local dishes. Spätzle, a German-influenced plate of tiny pasta found in Alsace cuisine is typically served with onions, butter and sauce though often is accompanied by meat (usually bacon). A definite must-try! Tartes flambées, another local meal is similar to a thin pizza with toppings, an appetizing way to fill your day - and tummy - yet if you have to choose between the two dishes, go for the Spätzle. Boutique Culture - This corner shop opposite the Cathedral is a treasure for those seeking an insight into Strasbourg's alternative cultural scene. The boutique offers information about on-going festivals, concerts and exhibitions that the Tourist office across the street might miss out on. Be sure to get a map and a list of 'underground' events happening here. Visit German town Kehl - In just a 15-minute tram ride outside central Strasbourg, you can find yourself German-bound. A small town on river Rhine that a lot of residents of Strasbourg visit and indulge in its low prices (mainly for booze and cigarettes). A ride in the tram - or any public transport - is a recommended must when in a new city, to cut through the city like a local and experience its road system. Cycle, cycle cycle - With adequate bike lanes in every corner, Strasbourg is a cycling heaven without Amsterdam's mayhem as this French town is generally quiet. Many students, professionals and elders use their bicycles to get around town and it's a fast, cheap and thrilling way for a traveler to see the city. Worth a roll. Explore the Street art - Whether you're on your way to a Saturday market in Place Kléber or in Place Broglie (hosting the Opera house and city hall) near Petite France, slow down and take a look at the buildings and walls around you as they might be hiding little gems. Central Strasbourg is decorated in street art in various random locations which you'll have to get lost to find. Generally a graffiti-free city, a few artists have discretely and tastefully began garnishing its streets. Behind a busy boulangerie rests a quiet alley, home to this anonymous graffiti. Similar work possibly of the same artist lay around town. Strasbourg is a quiet town - don't expect much of a nightlife - yet has a lot to offer. Incredible sunsets over the river, a spellbinding Contemporary Art Museum and lots of large green squares to sit and observe French life go by. In a hunt to unravel the city cycle, lose yourself and talk to the locals who break French stereotypes of refusing to speak anything but their language. A friendly crowd, a historical city, a travel well spent.